Mangaluru, Nov 3, 2018: Speaking to Ashwin Shetty about his life choices, you will be forgiven for thinking he is either a very enlightened soul or just stark, raving mad, the reason being, two years ago, he threw away a very lucrative job in Australia, packed up his protesting wife and son and landed back in Mangalore to look after his family’s lands and education Trust. For those on the outside looking in, Ashwin seemed to have it all. He was highly educated, had worked in many continents (Australia, Europe, North America, China), he was jet-setting around the globe as a business class passenger, he had a lovely wife and child, a six-figure salary, a home with a pool, the proverbial fancy car, the best gadgets money could buy and frequent foreign holidays. Born in Mangalore, Ashwin did his basic schooling in Alike, his PU in Canara College, his Diploma in KPT and his engineering in Mysore. So far, so good. A Masters at the University of Queensland and an MBA at the University of Southern Queensland took him to Australia and after these courses, he worked his way up to the post of Technical Manager with Airbus. Many of his peers envied the kind of work he did. 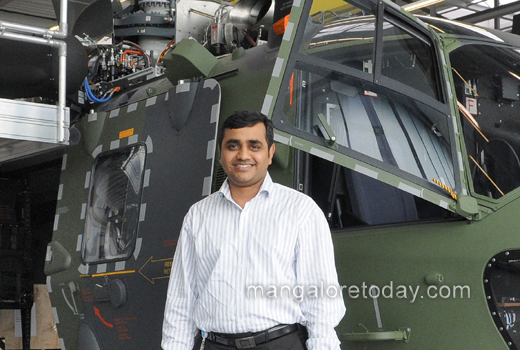 As a technical manager with the military division of Airbus, he handled the entire manufacturing process for Tiger Attack helicopters, and other military aircraft. He had security clearances from two countries (France and Australia) and if that was not enough, he was a NATO certified engineer. For a brief period, he was even involved with the Australian Submarine Corporation. But a 6 month work visit to China changed all that. Ashwin was in-charge of 8 ageing managers at the Beijing office, who would often confide to him that their children were not treating them properly or that they never spent enough time with their grandchildren. While these emotional outpouring were going on, Ashwin was also getting regular calls from his father-in-law to come back to Mangalore to help him look after a sprawling estate, properties scattered in and around Puttur and most important, to look after the family’s S N R Rural Education Trust. Packing up nearly 15 years of your life spent overseas was not easy. Firstly, his wife was distraught at leaving behind a home they had built and all their friends they had made. His son was born and brought up in Australia so leaving behind his comfort zone was daunting and Ashwin? “Well, my colleagues thought I had lost a few cents! They thought it was a mid-life crisis so they sent me for a mental evaluation!”. Having taken this giant leap of faith, Ashwin set about streamlining the businesses. “It was like entering into chaos! Abroad, you follow a very linear system. But Indians cannot work like that!” he laughs, recalling the first few months. He was lucky in that he was given a free hand to make what changes he needed. At the 60 acre estate in Savanoor, he wanted to bring in Australian high milk yielding cows but due to a government ruling, he could not do so. He bought four Bannur sheep (they are given free rein of the farm), installed a music system in the cow shed for the 20 Holstein Fressian herd, installed solar heating, cleared a huge swath of land for cashewnut cultivation and has dug two huge ponds for collecting rainwater. “Nowadays, I don’t crave gadgets and fast cars like I used to. 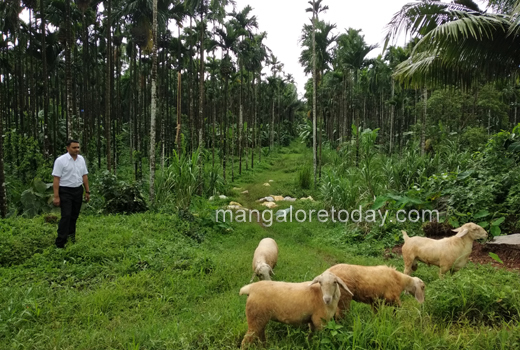 Instead of an Audi, I’d much rather spend that money on improving the estate” says Ashwin, looking around at the tangle of undergrowth that has sprouted everywhere after the rains. “I also don’t have to worry about sending e-mails to defense departments!” he quips. In a bid to reform the school curriculum, he has introduced robotics and Sanskrit. He regularly gives leadership talks. During the demonetization crisis, the school’s NSS cadets went into town and helped people fill in forms and deposit money. He has also sensitised teachers to separate religion from education and treat children as humans first. “Rural children are emotionally very stable and physically strong. With the right kind of exposure, they can become really big in their field of interest” says Ashwin. On the personal front, Ashwin is happy he came when he did because his son, Atharva, atleast got to spend two years with his paternal grandfather before the latter passed away recently. “When I left Australia, I made a conscious decision to spend time with family . So do I have regrets about leaving my fancy life behind? I think you know what the answer is!” laughs Ashwin, finally convincing me he is not mad.